Alice Joyce "Susie" (Stevens) Arnott. 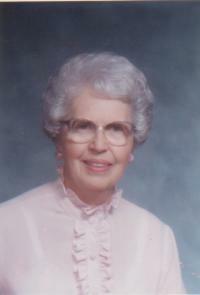 Alice Joyce Stevens, daughter of William Adkins Stevens and Beulah Elizabeth Ainsworth, was born on 31 December 1920 at Starkville, Oktibbeha County, Mississippi.2 Alice Joyce Stevens also went by the name of Susie.1 She was the daughter of William Adkins Stevens and Beulah Elizabeth Ainsworth. [S4] Birth Record photocopy or digital copy is in the personal records of this researcher, Florence, Pinal County, Arizona. [S120] 1930 United States Census, population schedule, North Beach, Nueces, Texas, sheet 38A, family 41.; digital image by subscription, The Generations Network (http://www.ancestry.com); from the National Archives microfilm. A printed copy is in the personal records of this researcher. [S480] 1940 United States Census, population schedule, Block 132, City and County of Denver, Colorado, Supervisor's District 7, Enumeration District 16-1121, printed sheet 63, stamped page 63, family 393, line 4.; digital image by subscription, The Generations Network (http://www.ancestry.com); from the National Archives microfilm. A printed copy is in the personal records of this researcher. [S16] Marriage Record, Appliction No. X-3375440. photocopy or digital copy is in the personal records of this researcher, Florence, Pinal County, Arizona. [S7] Death Certificate, Colorado State file number 96008925 photocopy or digital copy is in the personal records of this researcher, Florence, Pinal County, Arizona. [S36] Newspaper Obituary, unknown newspaper photocopy or digital copy is in the personal records of this researcher, Florence, Pinal County, Arizona.